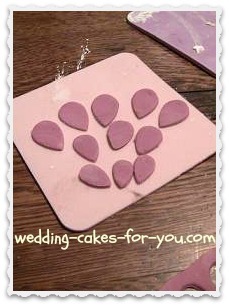 Making fondant flowers is easy once you know how. 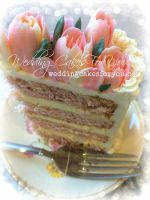 It allows you to create the most magnificent cakes. 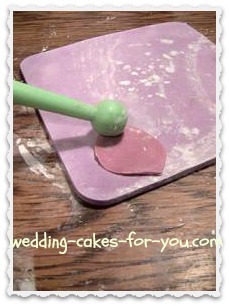 You can use colored pre-made fondant or color it yourself with paste food colorings. 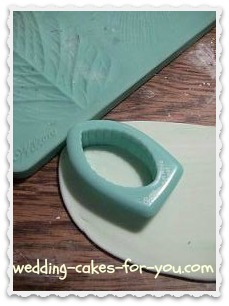 Fondant Cutters can be used to cut fondant flowers of any shape you desire. 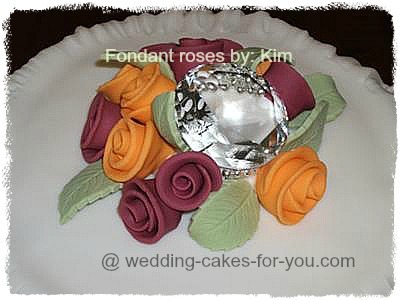 The rose in the tutorial below is made with Satin Ice. 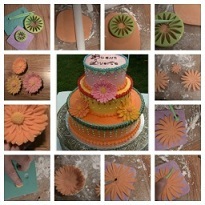 The method is the same for gumpaste flowers. 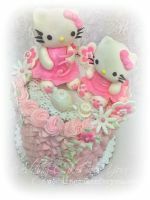 There are a variety of styles that you will see as you start exploring flower making with sugarpaste. 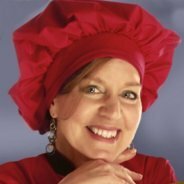 Experiment on your own and see what interesting ways you can find to make your unique. 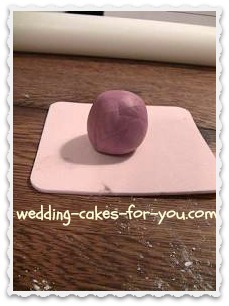 Roll a ball of fondant about the size of an egg in your hands. 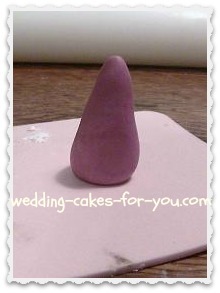 Form a cone shape with it by rubbing it with the heel of your hands. The cone should be about 2 inches high. Press the thicker end down onto the work table so that the pointy end is up. On the thin piece of foam that comes with your fondant flowers kit, press gently with a rolling motion to thin out the petal. Thin one of the edges a little more, leaving one side slightly thicker. You can do this between two pieces of plastic using your fingers if you don't have the tools. 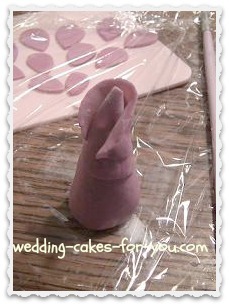 Brush a tiny amount of water mixed with the sugarpaste onto the cone using a paintbrush to help your petals to stick. Wrap the first petal around the cone with the top of the petal about 1/4 inch from the top of the cone. This first petal should be completely closed around the cone. Wrap the second petal overlapping the first one. You can unfurl it a little bit if you like but very gently to make it look like it's starting to open a bit. Place the center of the third petal at the halfway mark of the second petal and wrap it around and attach by gently pressing. Continue to build up the flower with the larger petals. Stretch the base of each petal and secure it as you go with the tiniest amount of the glue. Each petal should overlap the previous one about halfway. 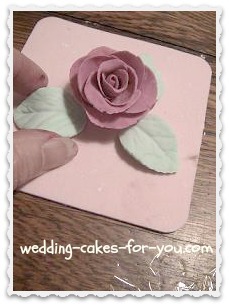 Cut the base of the rose so that it will stand upright on the cake or at a slight angle, depending on your arrangement. 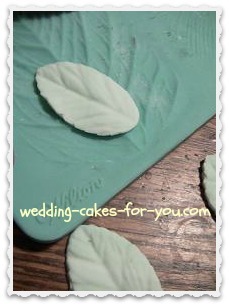 Roll out some green fondant and using a leaf cutter cut three leaves and press them into the impression mat to give it a natural look. 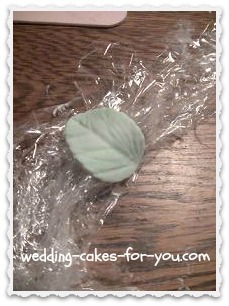 Use bunched up plastic wrap to lay the leaves over to give them some dimension. There are tools available for this purpose, but if you don't have them then try this easy method. 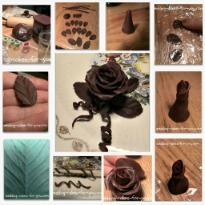 You can also use the plastic wrap method to place around the rose as a support as it dries. 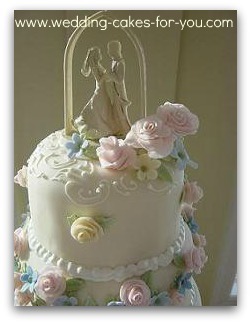 The photo below is a close up of the top of a five tiered wedding cake. 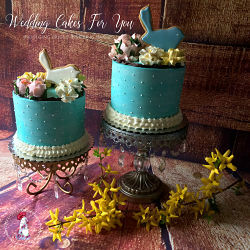 The roses are fairly realistic, the little blue and yellow fillers are very easy fondant flowers to make. 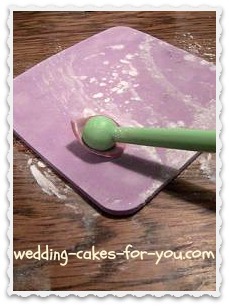 With cutters and other cake decorating tools you will be able to create all types. *Note: I use Satin Ice to make my flowers. 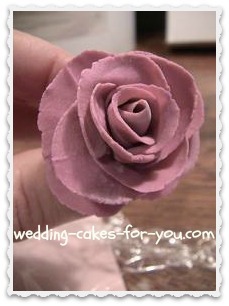 You can use gum paste, which can be rolled thinner for more realistic looking flowers and it dries harder as well. 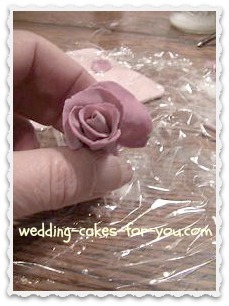 Here is an example of a very different style of rose using fondant. 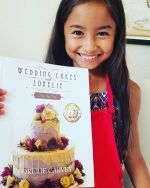 Make your own homemade fondant with a fondant recipe from this website. 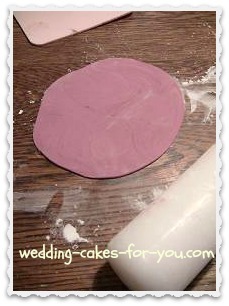 Some pre-made fondant products are very good, depending on the brand. Fondant dries very quickly if left uncovered. Always cover what you are not using with plastic wrap while working. Always use a clean surface, preferably marble if possible. Any speck of dirt will discolor the fondant. Dust the surface sparingly with powdered sugar or cornstarch while working to keep it from sticking, but not too much as it will dry the paste. Some of you may learn better by watching the process live on video. So whenever possible I make a video to coincide with the written tutorials. NEW video is coming soon with better lighting and close ups as I am currently updating my YouTube channel. 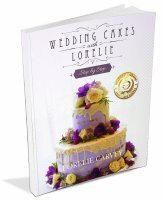 I promise to use it only to send you Cakes with Lorelie .